Allen, Texas - The Allen Americans explode for eight goals in an 8-1 win over the Brampton Beast on Friday night in front of a big crowd of 4,750 fans at Allen Event Center. Konrad Abeltshauser scored his first professional hat trick to lead the way for Allen. Greger Hanson chipped in two, his 25th and 26th of the season. Spencer Asuchak added his 12th, and Chad Costello posted a five point night, including goal number 40 on the season. Kevin Young had four helpers in the win. The Americans with a team record five power play goals tonight, going 5/8 on the man advantage. "We played solid all the way around," said the first star of the game, Konrad Abeltshauser. "We came out flying and never let up. This was a big win for our team." The Americans outshot the Beast 39 to 19 for the game. Brampton's only goal came in the second period on Jason Dale's 7th of the year. The Americans took 13 out of a possible 14 points from Brampton this season. 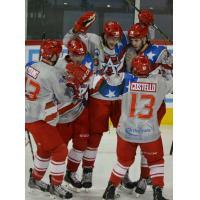 The Americans return home for the final two home games next Thursday and Friday at 7:05 pm against the Rapid City Rush. Playoff Tickets for Round 1, Games 1 & 2 are on sale NOW! Game 1 is Tuesday, April 14th at 7:05 pm and Game 2 is Wednesday, April 15th at 7:05 pm.